The Human Resources Development department at ABL held its first e-learning competition on “Fighting Money Laundering” at the “Higher Institute for Banking Studies” at Saint Joseph University on Tuesday, April 17, 2018. 23 banks participated to this competition and nominated a compliance officer from one of their branches to compete. 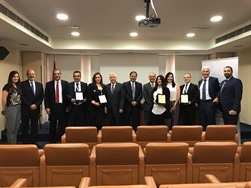 The four finalists were invited again at ABL on May 29, 2018 for the final competition: Mr. Hashem Abdel Rahim from Arab Bank p.l.c., Ms. Nadine Akkawi from Lebanon and Gulf Bank s.a.l., Mr. Nasser Chaabo from BLOM Bank s.a.l. and Ms. Nada Mroue Chamas from Bank of Beirut s.a.l. Their branch managers were also invited along with the HR managers. Mr. Bechara Khachan, HRD director at ABL, introduced the event, in presence of Mr. Chahdan Jubeily, head of the Committee for Compliance and Fighting Money Laundering at ABL. Mr. Nasser Chaabo won the competition and was awarded with a gift from ABL. He also received, along with the other contestants, a trophy and ABL’s Golden Jubilee Medal. The event ended with a cocktail ceremony.